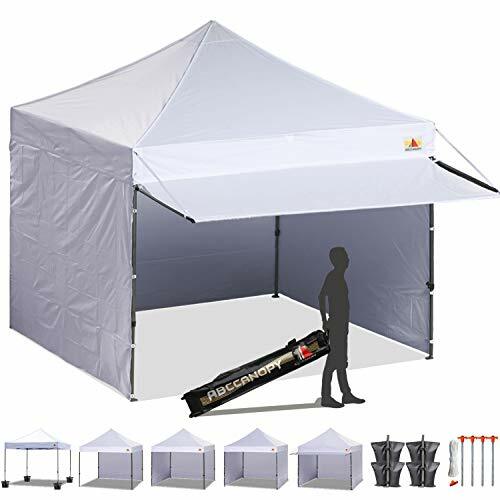 As a great accessory for a canopy tent, the sun wall play an important role in blocking the sunlight wind and rains out, as well as providing privacy. It’s a great companion to a business use or the outdoor living. No more too much sunlight to make the outliving day awkward. No more rains or wind to worry about. No more crowed people to make you uncomfortable. Make you business great. Allow you a perfect outliving day. You will deeply love it! 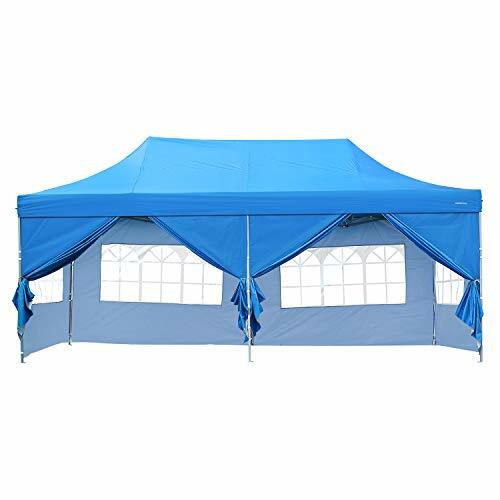 Add sidewalls to any canopy Improve your existing canopy tent with canopy sidewalls. 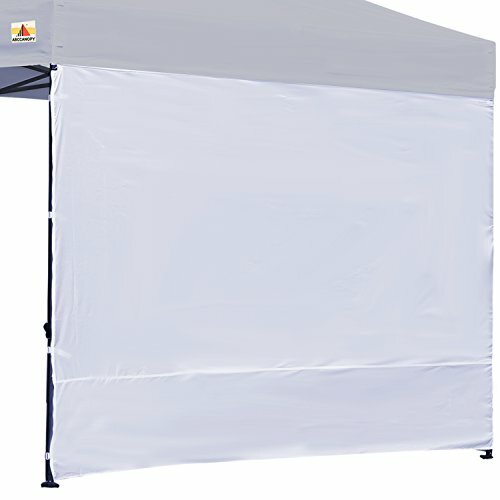 Made from high quality materials with tough stitching, this canopy sidewall will work with almost any 10ft square canopy. Popup canopy tent side walls are the ideal way to make your canopy more versatile so you can get the most out of it. A canopy sunwall can give you more shade, keep rain and wind out, and provide privacy. Whether you're using your existing canopy tent at a festival, fair, camping, school event or in your backyard, sidewalls give you more choices. 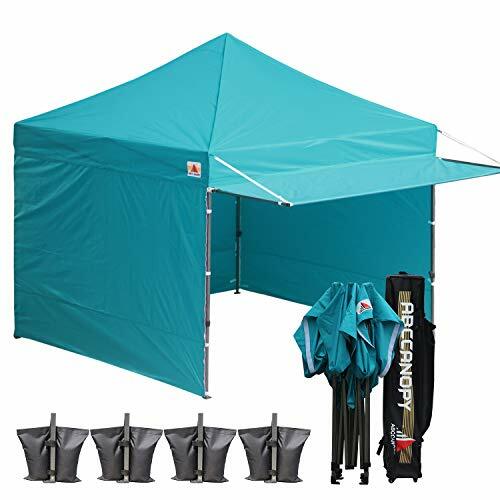 More privacy, less rain Designed to let light in while keeping rain, wind and sun out, this tent sidewall will withstand gusts up to 40mph. The panel attaches to your canopy frame with strong velcro straps. Zippers at the sides allow you to easily join multiple panels together so you can partly or fully enclose your canopy tent with side walls. Each pack contains one (1) sidewall panel. Made of heavy duty polyester, the panel measures 120x86in (3x2.2m). Factory canopy & Gazebos "Lowest Price Guarantee" All gazebo come direct from our factory to our warehouse so our prices just can't be beaten! There is simply no other competitor that has the level of infrastructure and therefore price advantage in place like we do. We are worldwide Leading Provider Our custom printing team has both sublimation and full colour digital printers. We use high quality polyester for our outdoor gazebo canopies and roofs. If you need your tent by a particular date, be sure to let us know, as our custom printed designs can be produced promptly! Our factory spans 23,000 square metres, and it is therefore able to complete small or large custom-printed orders in a very short time frame. Add extra weather protection to your sun canopy with the Coleman Instant Canopy Sunwall, Accessory Only. 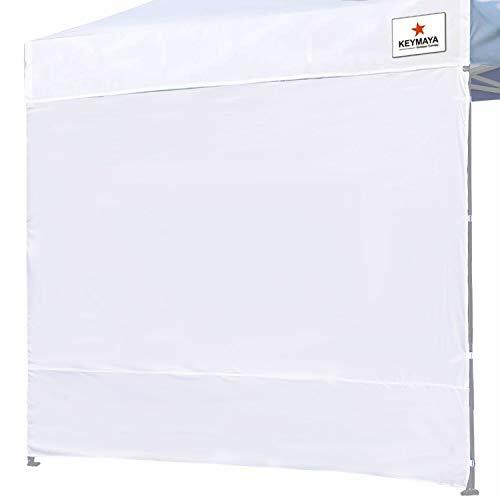 Designed for use with 10 x 10-foot straight-leg Coleman Instant Canopies (sold separately), this canopy wall is made of UV Guard fabric that provides UPF 50+ sun protection. The heavy-duty material can also help block wind and rain, creating a sheltered wall for your instant canopy. 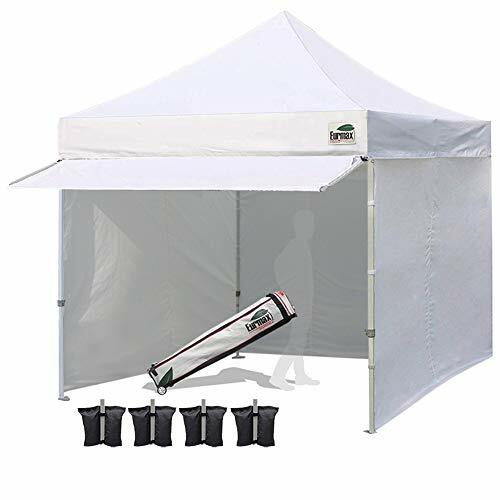 Protect friends, family and yourself from damaging sun rays with this Ozark Trail Sun Wall Tent. It is easy to install and well-suited for a wide variety of events including backyard barbecues and sports event tailgating. 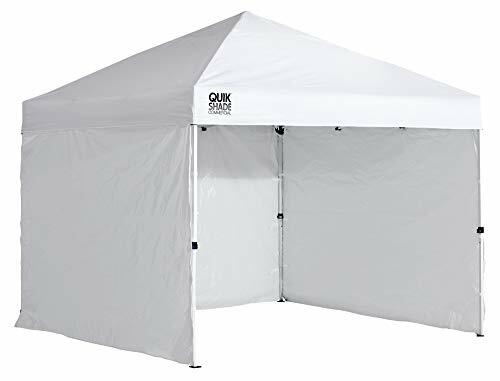 This Ozark Trail tent is constructed from durable polyester material capable of preventing dust, debris, rain and more from entering your tent. Weather:Only use Sunny. It is up to customers decision to determine the correct weathercondition when you choose the party tent. Installation :No additional tools of the canopy tent are required.You'd better tohave an assistant to help； just keep the frame steady when assemble thewedding tent steel tube and cover.Please assemble the tent with you yourfriend or who can help.Application:Theparty tent is perfect for wedding, party, meeting, camping and so on.And you can used the wedding tent for backyard barbecue with yourfriends, or the canopy tent is the best choice for your birthday partyas well.Other Precautions: When the frame is set up completely, remember not to tear the clothPlease make sure all the connections are tight before use.Please get the ropes tied and use tent peg to get it fixedIf you want to move the tent already installed, please move the four sides at the same timeComes with Ropes and nails for added Stability. 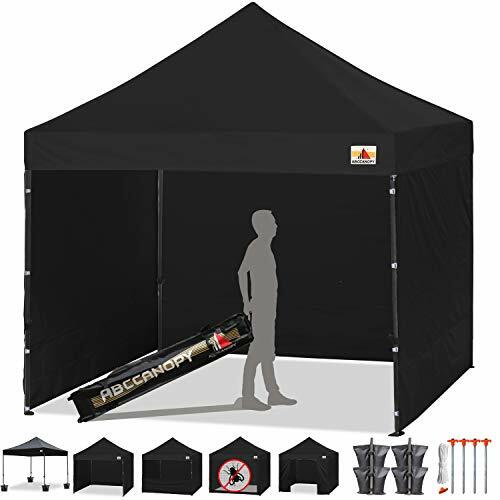 Please get the ropes tied and use tent peg to get it fixedWarning: Polyethylene Fabric of party tent is not fire proof, pls be away from sources of fire.Specifications:1. Color: White2. Weight: 12.13 lbs / 5.5 kg3. Dimensions: (118.11 x 118.11)" / (300 x 300)cm (L x W)4. Material: Polyethylene5. 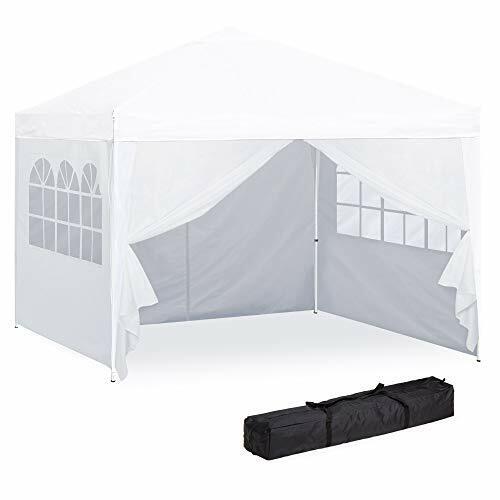 Frame: White Powder Coated Steel & PE Joint Fitting & Plastic Connector Package Includes:1 x Tent1 x InstructionWelcome to Ktaxon Garden Canopy.Products in this category include size of 10'x30',10'x20',10'x10',of 3 sidewalls,4 sidewalls,5 sidewalls,6 sidewalls,7 sidewalls,8 sidewalls,of 2 different connectors.We upgrade our product to make it more stable.Introductions:As we all know, tent is a commonly seen gadget in our daily life! If you are in need of a portable and practical tent, you can try this 3 x 3m without Sides Waterproof Foldable Tent! It is particularly designed for party only. It is not met to be up in the wind. This tent provides spacious room for accommodating many people. Its high-grade polyethylene material together with delicate workmanship ensure good structure and ruggedness. Do you want to have this one? 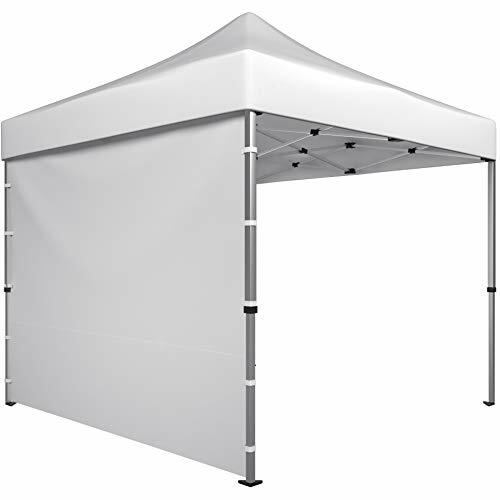 Make your tailgate, campout or backyard party even more enjoyable with the Ozark Trail 10’ x 10’ Instant Canopy. This canopy provides a true 100 square feet of cooling shade anywhere in just minutes. Simply extend the one-piece steel frame, attach the canopy top, extend the legs and you're done. Adjust the shade as needed throughout the day with the easy push-button system that has three leg height adjustments. 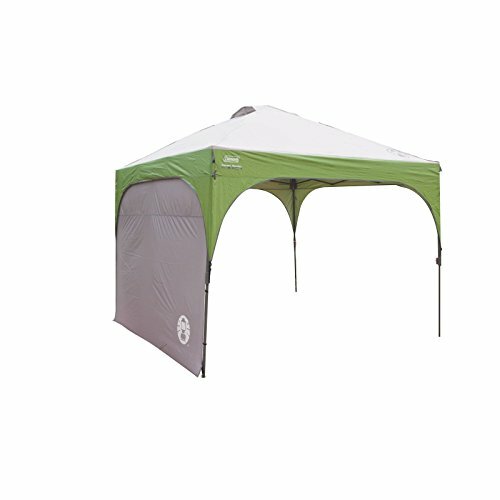 This canopy offers 50+ UV protection, so you’re protected from the sun all day long. For additional circulation, simply open the two included adjustable canopy vents. With the instant setup technology you’ll have your canopy up, tailgating and grilling burgers in no time! This canopy comes in various colors, so you’ll be sure to find a color you’ll love! 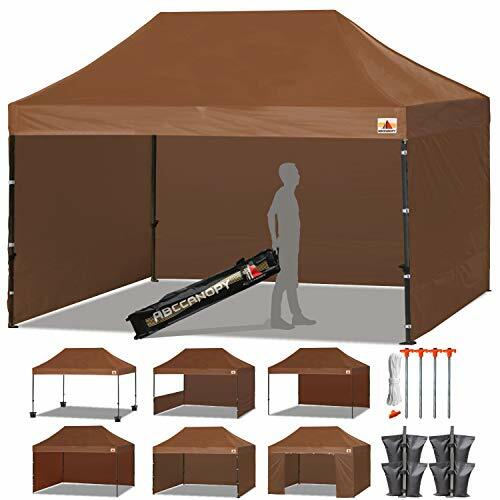 Carry and transportation are made quick and easy with the wheeled carry bag, so you’ll be able to take your 10’ x 10’ Instant Canopy anywhere. Durable Water Proof Polyethylene Cover. 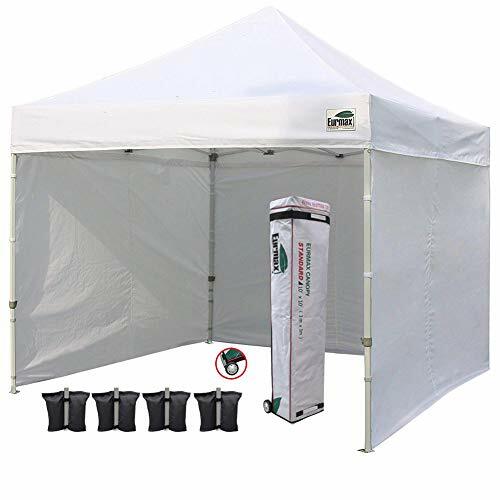 The Ozark Trail Instant Canopy is the perfect solution for sun and rain protection during cookouts, picnics, and sporting events. This pop up shelter sets up in seconds without straps, tools, or cables. Constructed with a rust-resistant steel frame and water-resistant fabric top, this canopy is sturdy and durable. Featuring four attached guy lines, telescoping legs, and a trigger mechanism to lock them in place. 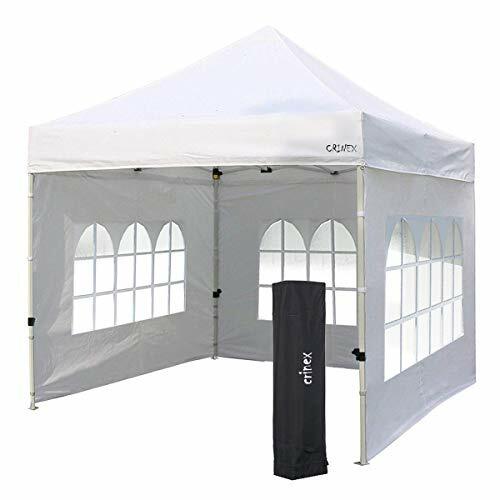 * Type 1： 10'x10' with 4 Side WallsSpecifications:- Model: 10 ft x 10 ft - Capacity: This tent can hold about 10 people- Frame: White Powder Coated Steel/w PE joint fittings- Product size(LxWxH): 10' x 10' x 8 1/6' (3x3x2.5m)- Top cover size(LxWxH): 10' x 10' x 1 2/3' (3x3x0.49m)- Sidewalls size(LxW): 10' x 6 7/12' (3x2m)Package Contents:- 1x Top Cover- 3x Sidewalls with Windows- 1x Sidewall without Window- 1x Accessory set- 1x Tube set- 1x Manual* Type 2： 20'x10' with 6 Side WallsSpecifications:- Model: 10 ft x 20 ft- Large Capacity: This tent can hold about 30 people- Frame: White Powder Coated Steel/w PE joint fittings- Product size(LxWxH): 10' x 20' x 8 1/6' (3x6x2.5m)- Top cover size(LxWxH): 10' x 20' x 1 7/12' (3x6x0.48m)- Sidewalls size(LxW): 10' x 6 7/12' (3x2m)Package Contents:- 1x Top Cover- 4x Sidewalls with Windows- 2x Sidewall without Window- 1x Accessory set- 1x Tube set- 1x ManualNotices:- 1.It requires 2 people to set up the tent for fast erection.- 2.Polyethylene is not fireproof, please keep away from fire sources.- 3.Please don't leave canopy up overnight or under bad weather conditions. Tents are temporary structures designed to handle most normal weather conditions. Evacuation of tents is recommended under bad weather or other unsafe conditions. We will not be liable for poor weather conditions or natural disasters.